After the system has come up again, we must provide a Hostname and a Domain Name. My server's name is server1.example.com, so I fill in server1 as Hostname and example.com as Domain Name. 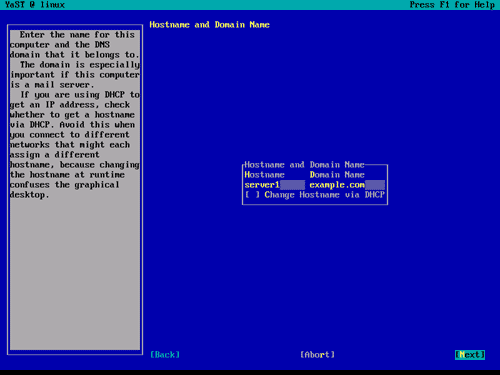 Afterwards, we disable Change Hostname via DHCP because a server's hostname should be static. 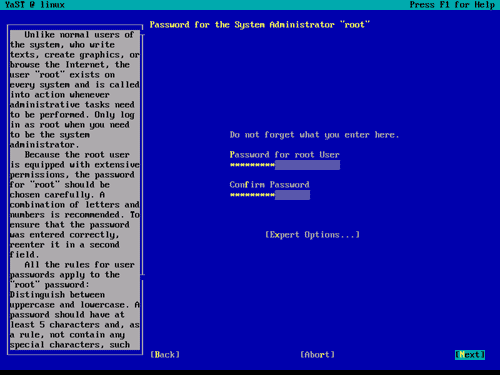 Next provide a password for root. Then hit the [Tab] key until the Next is highlighted and hit return. On to the Network Configuration. First we disable the default firewall. 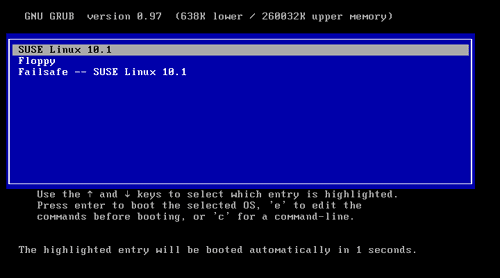 This is necessary to prepare the system for the ISPConfig installation. ISPConfig provides its own firewall. If you do not want to install ISPConfig, leave the firewall enabled. To navigate in text-mode use the tab and arrow keys. Enable or disable selections by hitting the return key.